Calgary Newspapers | What's YOUR Favourite? Search for more Calgary media. Calgary newspapers help this community keep its individuality secure in so many ways. Every city has its own characteristics, and Cowtown is no exception. When you visit Calgary you'll feel a Calgarian flavour prevailing in the air of city. Get into it! Calgary resembles a small world in itself. The city sports, venues, music and, of course, news don't let you forget that you are in Calgary. Speaking of news, Calgary has a lot of newspapers and broadcasting stations to inform you about local and international news. We have a number of papers in Calgary so let's start with the biggest ones. The Calgary Herald newspaper, The Calgary Sun with their famous Calgary Sun Classifieds, FFWD, The Calgary Real Estate News, the Bargain Finder and the U of C Gauntlet. The major dailies include the Calgary Herald, Calgary Sun and the national papers: The National Post and The Globe and Mail. Some of the favourite local columnists are Don Braid, Mike Bell and, not too long ago, Catherine Ford. And one of my choices, David Parker. Though there are a lot of other big and small newspapers the ones listed above form a thorough introduction to the publishing landscape here. And comics, don't forget the comics. The second largest of the Calgary newspapers is The Calgary Sun. A member of the Sun Publishing national conglomerate, this paper provides the same basics as the Herald, plus a list of features of its own. For comparison The Herald seems to be more of a sombre tone newspaper whereas the Sun is a bit more commercial and fun with lighter news coverage. And more ads. You could compare the Herald to Google and the Sun to Yahoo. If your thing is to look online instead, the papers' respective sites are Canada.com and Calgarysun.com. If you would rather do your own site, find out how to be successful at it. Of all Calgary newspapers, What is the Sun really known for? 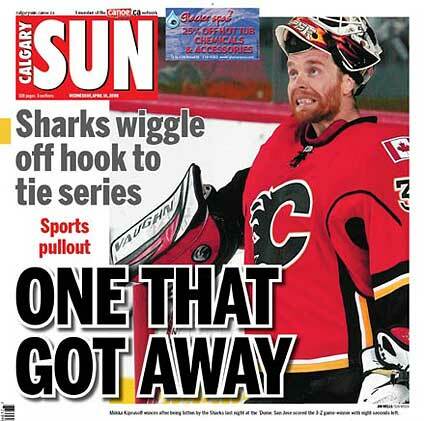 Calgary Sun Sports for sports lovers. Catch the action. Here you read the sportsmen interviews forums, details about matches, maps, analysis and a lot more. And that means Hockey. Oh. And don't forget the Sunshine Girl. Free specialty papers include the FFWD for local music and entertainment, and you can get The Calgary Real Estate News if you are interested in buying or selling property in Calgary or just want to keep abreast of the trends. Finally, the Gauntlet serves the post secondary students at the University of Calgary campus. Keep informed. Keep entertained. Keep reading. Go back from Calgary Newspapers to the Calgary Downtown Map web page.